John Cuidad born in Montemayor-el-Novo, Portugal, in 1495. His parents were respectable, but not of the richest class; they looked upon their only son as the chief treasure they possessed. But they were not to possess him long. One day, when John was eight years of age, he disappeared. Whether he had been deliberately kidnapped, or whether he had been seduced from his home by some enticing stranger, is not clear; at all events a short time after he found himself an outcast, a homeless waif, in the streets of Oropesa, in the kingdom of Castile, on the opposite coast of the Spanish peninsula from the place where he was born. There, in a foreign land, he had no one to care for him, nothing on which to live; he had to be content with whatever means of subsistence he could find, and he settled down as a shepherd-boy on the neighboring countryside. When he was twenty-two of age he joined a company of foot-soldiers, and in that company fought for the Emperor, Charles V, first against the French in Fontarabia, later in Hungary against the Turks. For some eighteen years John was a trooper employed in various parts of Europe. But while helping to win battles, he lost almost everything else. On the hillsides of Castile he had preserved some practice of religion; now he lost what little of faith and devotion he once possessed. He laid aside his morals; he was ashamed to be thought better than the comrades-in-arms about him; in the course of years John became as hardened in body and soul as anybody else. John had always a weak spot in his heart for the poor and suffering; however reckless his behavior, no beggar ever came to John but got relief, if he was able to give it. One or two events contributed to deepen these reflections. Once when he was out on a looting expedition he fell from his horse, was severely injured, and narrowly escaped being taken by the enemy. As he lay on the ground expecting death, instinctively the prayers of his childhood came to his lips. He appealed to Mary to save him, and somehow he was rescued. On another occasion he was set to guard an enormous heap of booty. When he was relieved it was found that much of the treasure had been rifled. Naturally the suspicion fell on John; even if he had not been partner in the theft, at least he had failed in his duty. He was condemned to be short; and that would have been his doom had not some more tolerant officer intervened to win his pardon. Experiences such as these strengthened his disgust for the army; he determined to be rid of it as soon as he could, and to return to the peace he had known. John was over forty years of age before his day of freedom came. After the campaign in Hungry his regiment was at last disbanded, and the men were landed on the coast of Galicia. John made a pilgrimage on foot to St. James of Compostella. At the shrine, he put himself right before God, he made his confession, and determined that in some way the rest of his life should be spent in atonement. With the joy of forgiveness came thoughts of his early childhood, and with them a great longing to know what had become of his family. He accordingly went into Portugal, to the town where he was born; he found that an uncle, to whom he contrived to make himself known. From him he learnt that his mother had died long years ago, partly of a broken heart because of the loss of her son; after her death his father had entered a Franciscan monastery, and there had ended his days. This discovery made a deep impression on John, especially at this moment. He looked upon himself, not only as a reprobate trooper, but as having been in some way the cause of his mother’s and his father’s death, and therefore unfit to live in their country any longer. John left Portugal, and returned once more to Spain. When John sought employment, he only fared like others of his kind. He had nothing to recommend him; his age was a further obstacle; he was miserably poor; in the need he counted himself fortunate to find a situation as a shepherd once more, in the service of a wealthy and benevolent lady who lived near Seville. Thus at the age of forty-two, John began again where he had left off twenty years before. But now he was a very different man. In his hours of solitude on the hills with his sheep he set himself at least to try to pray; during his prayer it came upon him more than ever what a wasted life he had lived. Indeed it had been more than wasted; he was appalled at the amount of harm he had done to others. There were only two conclusions to be drawn. On the one hand, if he received his rights from men, he would certainly deserve from them nothing but contempt; on the other hand, he who had done so much harm, would stood responsible for the lives of so many, perhaps his mother included, could never be content to remain in comparative ease among his sheep. In some way he must give what remained of his life in atonement for the lives of those he had ruined; he must do some good to balance the harm. John gave up his shepherd’s life and made his way to Gibraltar. Here he came across a Portuguese man who for some reason had been exiled from his country, and was about to settle with his family across the strait at Ceuta. He was utterly destitute; this decided John to go with him, and at least to begin by serving him. They came to Ceuta; their John found work on the fortifications, which were being built, handing over his earnings to his destitute fellow countryman. In a very short time a priest who worked in the settlement discovered him. When he learnt something more of his new parishioner and his past, he spared no pains to persuade John to return to Spain; Africa was no place for men like him. He pointed out to him the risk he ran by living in his present surroundings. In part they were too like those of his old days; his companions were not dissimilar, soon the temptations would return and he would fall. There was the added danger of association with Mohammedans. Already some of his kind had joined their sect, lured by their moral code, which suited their fancy better than their own; if John was not careful he would follow them, and his last case would be worse than his first. John listened to the warning of the priests and returned to Spain. He had failed in his first attempt, but he was in no way discouraged. He had made up his mind to spend his life in the two things we have seen, securing for himself the kind of justice he deserved, and somehow doing good to others; how these things were brought about mattered very little. Soon he invented for himself a trade, which served his purpose as well. He started to go from village to village selling pious pictures and religious books and objects of devotion to anyone who would buy, when he found a customer he did not part with his wares till he had given him, over and above. An exhortation to use his purchase well and be good. In this manner he came to Granada. While on this journey, tradition tells us that he found a small child on the roadside, ill-clad and barefooted, who asked John to carry him part of his way. Without more ado John lifted the child on his shoulders, and trudged along with his double burden. But the weight was heavy, and John was none too strong; when he reached a drinking fountain on the road John proposed to the child that they should stop and rest. The child came down from his shoulders but was suddenly transformed. “John of God,” he said, “Granada shall be your cross,” and immediately disappeared. Arrived at Granada, John continued the trade he had chosen for himself, but on a larger scale; if he could not preach, or help souls by any powers of his own, at least he could do good by such means as this. He rented a shop at a street corner near the city gate, and there continued to sell his pictures, books and pious objects. He was also a constant visitor at the neighboring church. Now it chanced that a preacher at that church was Blessed John of Avila, the friend of St. Teresa, of St. Francis Borgia, and of others well known for their sanctity. One day (it was the feast of St. Sebastian, a great day in Spain) John of Avila was preaching; he had taken for his subject the glory of being made a fool for the sake of Jesus Christ. John of God was among his hearers, during the sermon it struck him that here was an obvious and simple solution of his first problem, that of making people treat him as his past life deserved. If he could do nothing else at least he could do this; if he could be nothing else at least he could be a fool. No sooner was the sermon over than he set to work. As the congregation poured out in to the street, John went before, crying out for mercy, tearing his hair, beating himself on face and body, rolling in the mud, sitting on the pavement at the feet of the passers-by. So he moved from street to street, amid the ridicule of the neighbors, and to the intense amusement of the children who followed him in crowds. The more they laughed the more John persisted in his folly; he played his part to perfection. Soon the neighbors were convinced that the keeper of the shop at the corner of the street was of unsound mind. He had always been different, so they said, now they saw that he had fits of insanity, and they began to be sorry for him. Accordingly on another day, when service was about to begin in the church, John threw himself on the ground, and began again to cry out for mercy, louder than ever before. Some pious members of the congregation took hold of him, and carried him off forthwith to the nearest lunatic asylum. At last John had got his wish; he was really taken for a fool, and was to be treated according; to assure himself that this treatment should continue, in his prison he began to play the lunatic more than ever. Now in those days the chief cure for lunacy was the whip. John therefore, as a particularly troublesome patient, was taken out every day and scourged; but the more his keepers scourged him, the more did John persist in his folly. At length one day what was going on reached the ears of Blessed John of Avila. Now Blessed John, probably through the confessional, had come to know the shopkeeper a little; and though he easily allowed that he might be what men would call eccentric, he was certainly not mad nor in any sense a lunatic. Blessed John of Avila went to the hospital, and asked to see John alone. Then he gave him a sound scolding. He pointed out to John that he was untruthful; he was pretending to be made whereas he was quite sane. He was unjust; he was living on the alms intended for lunatics, while he was quite able to look after himself. He was wanting in charity; for he was giving endless trouble to everyone about him, though he had resolved to spend himself in their service. All this made John see his folly in a new light. He became immediately sane, and Blessed John of Avila was soon able to secure him his release; possibly some may have though he had worked a miracle. John came away from his prison, and again betook himself to his little shop. But by this time, as the lunatic episode proves, it had grown too small for his zeal and his energies; he could not wait all day for good people to come to him, he must find something else to do. First he went on a pilgrimage to Our Lady of Guadeloupe, and apparently came back with his mind made up; at last it would seem, after all thee years, he had discovered his true vocation. He came back to Granada, rented another house, and immediately began to gather in it all the refuse inhabitants of the town. It did not seem to matter how they were homeless tramps and vagabonds, cripples begging at church doors, the poor in the streets wherever he might find them, prisoners let out of goal, all seemed the same to John; he invited them all to his house so long as there was a board on which they might lie. Often enough, we he found on the road beggars too deformed to able to crawl to his lodging, he hoisted them upon his back and carried them there himself; John with such a load became a familiar sight in the streets of Granada. Within the house John did all the work himself. He had at first no servants, no nurses; his experience in the wars now stood him in good stead, for there his natural charity had taught him something about wounds and bandages. So he set to work with the little he knew. He could wash his patients and dress their sores; he could kiss their feet and let them feel that somebody cared; he could put them to bed and give them a sense of home; he could sit by their side and be merry with them, and then could induce them to go to confession and pray; it was all very rough and ready, but it suited his household. At first the neighbors resented his conduct; in no long time they were glad to let John go his own way. For the maintenance of his establishment he went out to beg. He had been a hawker and had learnt how to use his voice in the streets; moreover, with his keen sense of humor, he had discovered ways to induce men and women to buy his wares. He went about the town, rattling a tin can in his hand, shouting as loud as charity could make him, and the burden of his cry showed that his humor had not deserted him. “Do yourselves a good turn, ladies and gentlemen, do yourselves a good turn,” was the form of appeal he adopted; and its novelty made his hearers laugh, but it also induced them to open their purses. Money began to come in by this single channel; very soon those who gave John alms followed him to see what he did with it. Their eyes were opened; they were astonished to discover what single man could do unaided, and a man without any qualifications whatsoever. He was neither nurse nor doctor, neither priest nor religious, his education was virtually none, he had no one to help him except his own patients, who occasionally caught the fever of his charity. Very soon there grew up about his house a group of more wealthy men and women who took pride in calling themselves his benefactors. Meanwhile the work he was doing attracted then notice of the ecclesiastical authorities. There were those who were suspicious, who had little faith in such freakish ways; there were others who could not but see the astonishing fruit of John’s work. He was called to meet the bishop, who also at the time held the post of Mayor of Granada. The bishop asked him his name; John replied that once upon a time a child he had helped in a country lane had called him John of God. “Then John of God shall be your name always,” the bishop answered, and this was how he came to have the title. Then the bishop asked him about his dress. For John, even in this august company, presented a sad appearance; he was wearing a suit of clothes he had taken from a beggar in exchange for his own. The bishop bade him to wear a habit; by this dress it would be clear to all that he acted with the bishop’s approval. The next step was a hospital proper which the citizens of Granada gave him; and by a hospital we must understand a kind of workhouse, though even a workhouse, as we now interpret it, would be much too good a name. Henceforward John had to give himself to administration; he had a staff of volunteers who worked under his direction, many of them men who he had rescued from misfortune, who were ready to make amends in the way he showed them. Again, there were many, young and old, who never forgot that he had once been an inmate of a lunatic asylum, and treated him accordingly. Once a boy met him, carrying a bucket of dirty water. He poured the contents over John the lunatic; whereupon all in the street burst into laughter. But John burst into laughter with them; which made some think him only a greater fool, while others thought him a saint. Another time John’s cloak accidentally brushed against Spanish gentlemen, and fell to the ground at his feet. The gentleman was indignant, and dealt John a staggering blow; John recovered himself, picked up his cloak, and then stood before his assailant for another. But these were only the outside trials, which signified nothing to John and troubled him very little; which affected him more were the persecutions coming from inside the hospital. There were the many quarrels among the patients themselves, almost inevitable when we consider who they were; and John, in his efforts to be peacemaker, came in from blame from many sides. They would denounce him for injustice, or extravagance, or something else; there were times when it seemed that all his labors had come to nothing. Most troublesome of all were the women whom he had rescued from a life of sin. He had been more than once warned that to do more for these poor creatures than to take them from their evil surroundings was dangerous. They were treacherous by nature, they were ungrateful, they were notoriously unstable, their very repentance, in most cases, was only a pretense; if he did more for them they would only turn upon him. John was well aware that this was only too true; nevertheless he went on as before. He found them a home, as we have already seen he procured the means to give many of them a new start in life; still it was only to receive in return, for the most part, what his friends had told him would come. In the home he had provided for them these poor, restless creatures were difficult to control. They were never satisfied; no matter what he gave them they always asked for more. They looked upon themselves as something superior to the beggar man about them who had made himself their slave. Abuse was all he deserved, and he received it from them overflowing. When he could not find for them all they demanded, when he attempted to suggest to them better thoughts than those they had always in their minds, then they would turn on him with ridicule, call him a hypocrite and a bigot, hint to him that he knew too much about their lives to be himself wholly innocent. 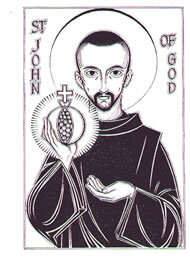 John of God was a saint in a category all his own. He lived his own life without anyone to help him. He grew in sanctity after his own manner, he did his work almost entirely single-handed. Another time he found a beggar in the street, deserted and apparently dying. As usual he took him upon his shoulders, and carried him to his hospital. There he laid him on a bed, and began to wash his feet. But the feet had gaping wounds in them; John looked up in surprise, and found the beggar had been transfigured. He seemed to be all shining, and the brightness seemed to envelop John himself. When he was again alone, and was walking through the hospital, so brilliant a light shone about him that the sick in the ward took alarm, thinking he was on fire; and John had much difficulty in assuring them that all was well. So John went through the last fifteen years of his life, keeping his two resolutions, to atone for the harm he had done to others in his early days by doing only good to them now, and by ignoring his own very existence. He gave when he had nothing for himself; when he was ill, which was often, he took no notice of his illness that he might serve others who were worse. But there came a time when he could hold out no longer. One day, when he was out on an errand of charity, he chanced to pass along the riverside, and saw a man in the river drowning. Without more ado he went into the water and saved him, but he came home that evening shivering and in high fever. He struggled on to his ordinary work, but at intervals he was obliged to lie down in his own hospital, alongside of those he called his children. These children took alarm; to do such a thing was unlike their father; they would get out of their beds and crowd around his couch, so that John was in danger of being suffocated. A benefactress came to the rescue. On one of her visits to the hospital she discovered what was going on, and wished to have John taken to some other home where he might be better tended. But John demurred; not until she had been supported by the express order of the bishop would he consent to be removed. In this way he came to die; when the end seemed certain the bishop himself gave him the last sacraments. Then he was asked whether he had anything on his mid. Yes, he had. His answer was characteristic of the man, the model of practical charity. ‘There are three things that make me uneasy,” he said.” The first is that I have received so many graces from God, and have not recognized them, and have repaid them with so little of my own. He was reassured on these points and his mind was set at rest. Then, even more characteristically, he requested those round his bed to leave him alone for a few minutes; he had lived his life alone, he would die alone. When they were gone he rouse from his bed and knelt before a crucifix. The nurses entered shortly after and found him still kneeling there, his face resting on the feet of the Savior, but he was quite dead. His body remained kneeling till it was taken up to be laid out for burial. It was the eighth of March, 1550, a little after midnight. At the time of his death John was fifty-five years of age.